Sleepy Bunnies Quilt. 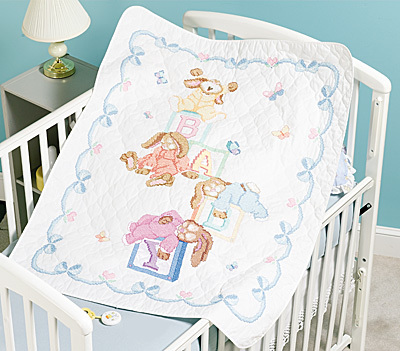 This adorable quilt will brighten up your nursery or accent the room as a wall hanging. Kit Contains: Screen printed, pre-finished50% polyester /50% cotton Quilt. 6- strand cotton floss, needle, complete instructions. Finished size 34" x 43"